Gojo, a small town on the bus and train route to World Heritage destination Koyasan, has a charming historic centre and retro atmosphere. The town is famous for persimmon fruits and kakinohazushi: sushi wrapped in persimmon leaves. The machiya houses are well-preserved, thanks to a local project encouraging creatives and small businesses to move in and maintain them in return for low rents. The main street, Shinmachi-dori, runs between two train stations, making navigation easy. 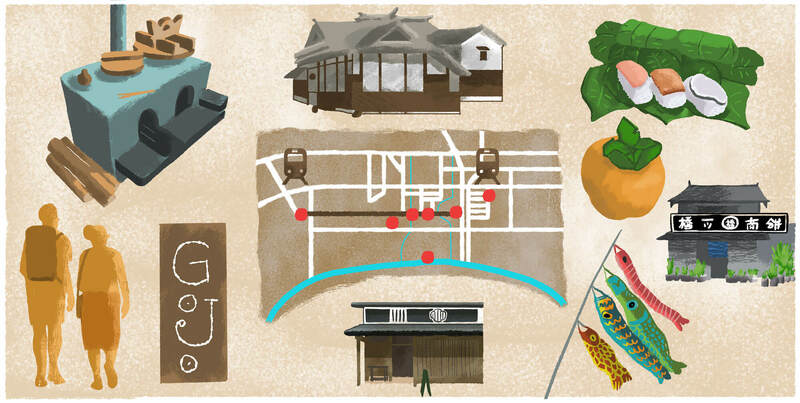 Many machiya houses have been converted into cafes and galleries, like Kitayama Gyunyuten and the Machiya Museum. Mochisho Hitotsubashi is an essential stop for photos and mochi sweets. From Gojo Station, the town looks modern and suburban, but as you meander down the hill towards the river, you’ll find traditional shops and houses. Nakako Shoyu supplies soy sauce to Nara’s top restaurants and the family can show you the production process. The town sits by the fast-flowing Yoshino River, making it the perfect location for adventure sports like rafting and kayaking, which can be organised by the local company Ever Green. Try snow shoeing in winter. If planning a trip to Koyasan or further south to the Kumano Sanzan shrines in Wakayama prefecture, Gojo, makes for a strategic overnight stay. Yanaseya, a large restored machiya house in the middle of the historic Shinmachi district is one of the most luxurious accommodation options. One Nara specialty you will certainly encounter is kakinohazushi: lightly pickled mackerel or salmon wrapped in a persimmon leaf. It was developed during the Edo era around the Yoshino River near Gojo. Locals found that persimmon leaves helped preserve the sushi, making it suitable for long treks into the forest. The flavour is unique, but it’s worth a try! Learn more about Nara's unique cuisine. Gojo is best known for its persimmons, and even has a museum dedicated to them. Besides the fruit simply being eaten, persimmon leaves were traditionally used for purposes like food preservation and waterproofing umbrellas. Today the fruit finds its way into liquor, sorbet, smoothies, and more. Kakiha is a great place to try many of these. When strolling around in autumn, look out for strings of persimmons hung to dry from the eaves of shops and houses. Gojo's scenic townhouses are worth visiting in any season. Avid photographers may want to visit in the morning when there are few tourists, or at dusk when the buildings take on a dim glow. If visiting in summer, don't miss the fireworks display held along Yoshino River. Gojo can be navigated easily on foot, with Shinmachi-dori Street just a short walk from the train station. Local buses also operate from the station, but information and timetables are only available in Japanese. If you want to catch a taxi, have a shop assistant or friendly local help call one for you. Gojo is an excellent place to take in Edo period architecture without the crowds of similar areas, but certain shops and restaurants operate irregular hours and may close early on quiet days. Visitors should take this into account when visiting on weekdays, especially during off-peak periods such as winter. Gojo enjoys a convenient location on the bus route between mountain-top temple complex Koyasan and Kumano Hongu Taisha, one of the sacred Kumano Sanzan shrines. Trains to Koyasan also run from Gojo Station. A night in Gojo allows for a relaxed start to a trip to either of these World Heritage destinations located in neighbouring Wakayama Prefecture. As with many destinations, Gojo can be reached by either JR Nara or Kintetsu-Nara Station. That being said, leaving from JR Nara Station is the quickest route at a little over 90 minutes.